Have you ever wondered how we as a collective humanity are going to manage to develop and carry out effective solutions to our rapidly deepening global environmental, social, and financial crisis? Since the human mind is the variable that defines how technological and other advances are going to be used to address our global issues, and psychology is the social science that studies the human mind, how can this body of knowledge purposefully and tangibly contribute to a critical movement forward toward effective and immediate global solutions? This has been a central issue for me since my early work on critical moral consciousness, individual and community healing, and cultivating an integrated life. I have been thinking a lot both about the power of individual choice and also about the shaping power of the collective socio-historical contexts that we consciously or unconsciously create. I have always wanted to articulate the clear systemic links between individual health and collective social health, and their hidden spiritual dimensions. I have felt that to be particularly important in our current global context of clashing religious and secular views on how to address global issues. That inspired me to take on the role of senior editor and main contributor to the volume that just came out – Toward a Socially Responsible Psychology for a Global Era. You can find it on Springer website by clicking on the image below. Developing clinical practice suited to a global community. Attaining global consciousness in the context of societal health. Overcoming racism, sexism, and poverty. Healing the causes of human suffering and environmental harm. Conceptualizing and actualizing justice restoratively. Achieving a psychology of nonviolence. 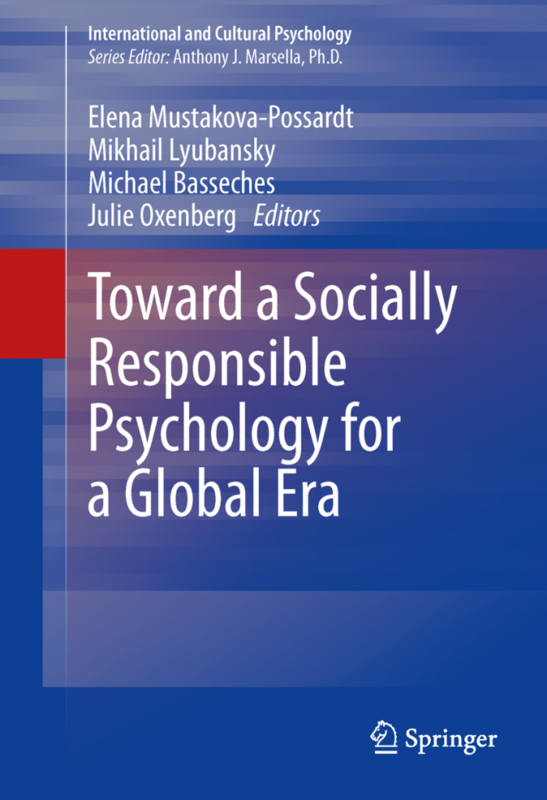 A volume with a clear moral vision, Toward a Socially Responsible Psychology for a Global Era is an affirmation of purpose and a call to action for psychologists to bring greater relevance to their profession towards building a shared just, humane and sustainable future. For those of you who care about these issues, I would love to hear your feedback.